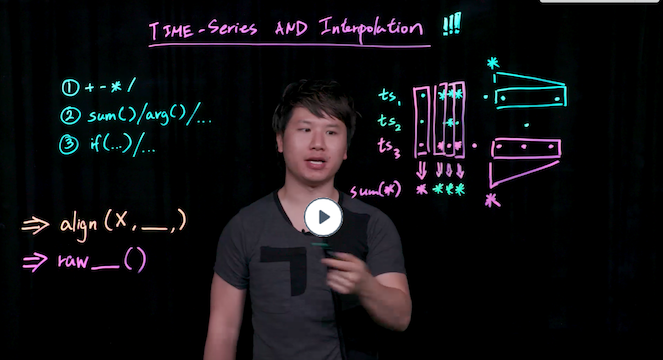 Understand discrete and continuous time series and when Wavefront performs interpolation. 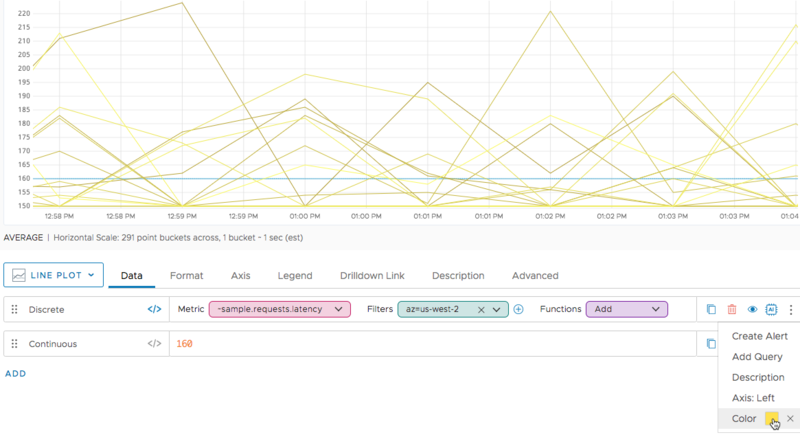 Many Wavefront queries operate on and return data as one or more time series. Each time series is a unique sequence of data points that consists of a data value and a timestamp. A continuous time series contains one data point per second. Because Wavefront accepts and stores data at up to 1 second resolution, a continuous time series has a data value corresponding to every moment in time that can be represented on the X-axis of a chart. The following chart shows a point plot for the results of two queries. The query labeled Discrete returns multiple time series, each consisting of data points that occur 1 minute apart (at 9:30, 9:31, 9:32, and so on). The query labeled Continuous returns the constant value 160 for every second in the chart. Most query language functions that operate on a discrete time series return a new time series that is also discrete. The floor() function visits each point in a given time series, rounds the point’s data value down to the nearest integer, and assigns the result of that calculation to a new point with a matching timestamp. The align() function groups the input data points into “buckets”, and returns a new series that consists of one data point per bucket. The lowpass() function returns a new series that consists of data points that match just the input points whose values fall below a specified threshold. Certain query language functions and expressions return a new time series that is guaranteed to be continuous (have one data point per second). The expression 160 assigns the value 160 to every data point in a continuous result series. The at() function obtains a value from a past data point in an input time series, and assigns that value to every data point in a continuous result series. The dayOfYear() function produces a time series by correlating every second of a time line with the day of the year it falls on. The last() function produces a new time series that consists of the actual, reported data points from the input series, plus points that are added by interpolation between them. Each interpolated point has the same value as the last reported point before it. Here’s a point plot showing a discrete series (the red dots) and the points (blue dots) produced by applying last(). The points of the discrete series are reported once a minute, and the points between them are all interpolated. When the last() function inserts a new point with a particular timestamp, the value assigned to that point is taken from the last actual, reported point before it. When the interpolate() function inserts a new point with a particular timestamp, the value assigned to that point is an estimate of what the input series would have reported at that time, based on the values of the actual, reported points on either side. Functions such as last(), interpolate(), and the others summarized below use interpolation to fill in all gaps to produce a result series that is guaranteed to be continuous. Standard aggregation functions such as sum() and avg() use interpolation to fill in specific gaps in an input series before including that series in the aggregation. The result series produced by an aggregation function is normally discrete. Aggregating Time Series gives more details. Moving time windows except integral(). if() function, when expression is not a constant time series. between(), exists(), and random() functions.